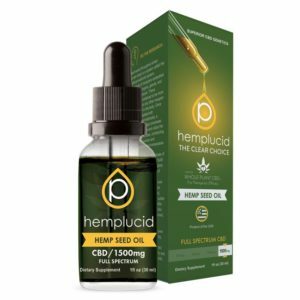 Hemplucid Hemp Seed Oil CBD Tincture. Whole Plant Cannabidiol mixed with Hemp seed oil. Desirable 3:1 ratio of Omega 6 to Omega 3 fatty acids. This oil also contain minerals such as potassium, magnesium, iron, zinc and calcium. Tincture is GMP certified, Non-GMO, USDA Organic and Kosher. Natural flavor for oral consumption or to be mixed with food. Available in 250mg, 500mg, 1000mg and 1500mg sizes.